As we have articulated many times, biblical faith (See Footnote #1) has more to do with trusting that God is in total control of the believer’s life, rather than the assumption that faith is mainly a tool for getting what is desired. There is always a place for petition with God, which is precious and important in the relationship the believer has with His Father, yet this is not the primary function of faith. Faith is the most important ingredient in any and every relationship that a human being will ever have. This is because faith is the foundation of every relationship a human being will ever have. Faith is not an option, faith is a necessity in order to maintain any relationship. Many equate the difference between faith and trust (See Footnote #2), in that faith is a noun and trust is a verb, yet in the Greek the verb form of faith is generally translated believe. This is due to the fact that in the 16th century, just prior to the creation of the King James English Bible, the verb form of faith, “faithe” or “faitheth“; fell out of use, and was subsequently replaced by the word believe, which at the time was somewhat synonymous (See Footnote #3). The problem arises and that the word believe came to mean a mental assent only, a cognitive function without the necessity of action. Wherein the Greek word for faith has always transcended mere mental assent (Remember James 2:19 – “Thou believest that there is one God; thou doest well: the devils also believe, and tremble. “; mental assent does not mandate action, as seen in the demons that factually believe God and his power, yet refuse to submit based on either), which is mingled with confidence which holds the rigidity of conviction wherein actions and behaviors are created and displayed based upon an unmovable assurance (See Footnote #3). Of all the attributes that Adam received concerning the image-ness of God, wherein after his fallen state man has corrupted; faith is the only virtue that maintains its integrity, wherein the sinfulness of man has corrupted all other virtues by default. 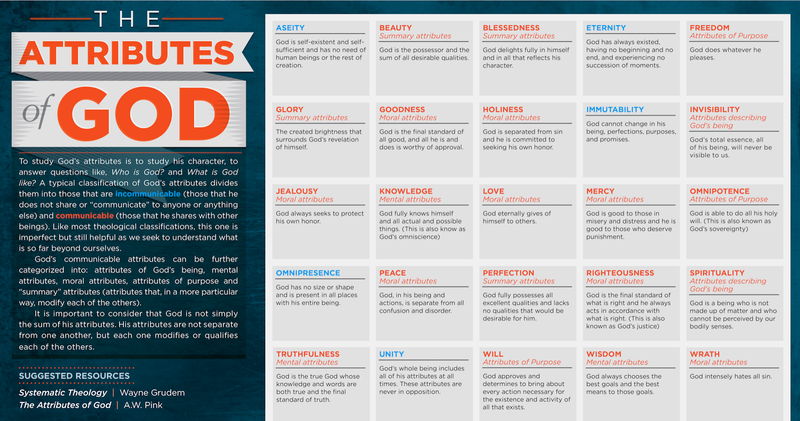 All of these attributes / virtues (This list is not meant to be comprehensive, and there is a definite distinction between the attributes of God and His creation, man’s attributes) which has been incorporated within man, which reflect his creator, God. All of which have become corrupted due to man’s fallen state, though opportunity for their virtuous function is always available. Yet it is faith – the ability to trust another person (Human), being (Divine or other), or thing which has maintained the greatest ability regarding its function, though it too has been abused and misused ad nauseam as typified in man’s other attributes. However, it is the purity of man’s conviction to trust to the extent that he can so easily be abused and even deceived that displays a sense of nobility wherein few human beings can function without trust in others and maintain a healthy soul. We refer to these individuals who cannot trust (Exercise faith) as sociopathic and psychopaths; unable to maintain healthy loving relationships of caring concern for others, void of sympathy (The ability to appreciate the pain of another without having experienced the situation yourself), empathy (The ability to appreciate the pain of another having experienced the situation yourself), or simple compassion. It is in coming to understand the complexity and necessity of biblical faith that the child of God not only must understand, but must also hold without reservation the conviction that God is in control of everything in their life (His ability), and that His interest for His child is only for their good (His integrity); no matter how devastating the situation, no matter how commanding the display which opposes these facts. “and” connects this verse with a prior verses dealing with Christ making intercession for the saints according to God’s Will, as well as our hope in Christ, the deadness of our flesh, and the futility of fallen man. The reason why we know that all things work together to them that love the Lord, is because there is no condemnation in them – they are declared innocent, as opposed to condemned. How unfortunate that the translators could not believe that this statement did not need qualifications, in the fact that they added this last section to the verse: “who walk not after the flesh, but after the spirit.” These words did not appear in the original text, but was added by the translators, therefore it is not inspired of God. God did not place a condition on those that are in Jesus Christ, who place their faith in Him as the propitiation for their sins as we read before in Romans 10:8-10. 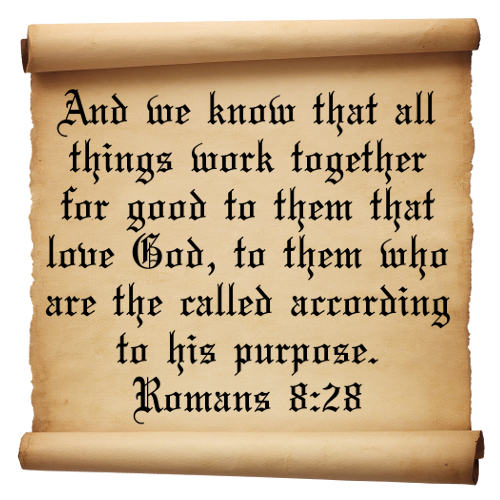 The reason why we can take such comfort in this concluding verse; holding in faith that all things will work together for good unto us, is because Christ died for us, and made us sons and daughters of the Most High God. This is the reason that we know that God is always taking care of us, no matter what the situation looks like from the outside. “we know” is more necessary than any other aspect of this verse, due to the fact that God mandates that we know – which is a synonym for faith. If the Believer does not know, and therefore cannot stand in the surety that God is taking care of him, then faith is nonexistent. 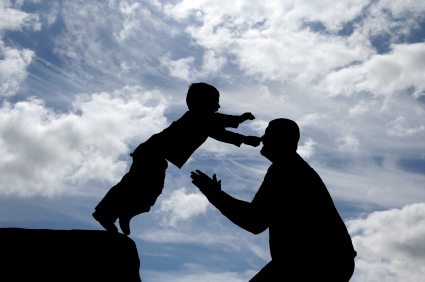 Faith is based upon trusting God, that He is loving and merciful to His children. It is in trusting the goodness of God that even when bad things happen, God who is all-powerful has allowed it because good will come out of it. This is saving faith, that of knowing; not speculating, but knowing God is faithful. “all things“, not some things, but everything – no exception! “(He) work together“ (verb) partner with each other, cooperate fully. “All things work together“ (synergeo): Present Tense: A continuous action; active voice: The subject (God) produces the action. One thing we need to realize is that our present cultural mindset wherein immediate gratification is so prevalent can blur our understanding of what is “good”is, based upon what is current. A good example is the hundreds of thousands of Christians that were burned at the stake within less than 100 years of the ascension of Christ. It was not good to be burnt alive, or eaten by wild animals. Yet when they walked through the doorway of death into the presence of our Lord, what was good was that they have a martyr’s crown, a very special reward for having displayed faith more than any other act possible – that of dying for our Lord in faith, and in most cases the most savage of deaths. The good that this Scripture speaks about is their reward in heaven, not their pain on the earth. We need to maintain a biblical mindset understanding that the good may not be immediate, but that it will occur. “to them that love God“ Thayer: Greek verb: “agapao,”To love: to be sold out completely, to sacrificially put another 1st, to hold preeminent in all things.” This refers to the children of God that love their Father, and He who gave His life for them, their Lord and Savior Jesus Christ. This is a synonym of a born-again believer. “to them who are the called“ (The definite article refers to specific individuals, Born-Again Believers as individuals – not a class of individuals) those chosen by God, that have responded in faith, who become adopted children of God according to His mercy and grace. The definite article being used indicates specific individuals, NOT a general group as stated in Arminian theology (And NO I am not a Calvinist – I follow Jesus Christ and what is in His Word, The Holy Bible). “the Called“ (kletos): “to be summoned to,” “divinely selected and appointed“ (Rom. 1:6; Rom. 8:30). Example: the saga of Joseph (Gen. 50:20). Again this refers to specific individuals, not groups of people. “according to his purpose” this gets back to the issue of faith and trusting that God has specific purposes within the life of the believer that is worthy of complete confidence. The word “his” is in italics because it is not in the original manuscripts, but is implied by the context. The idea is that God is perfect and His will is perfect, and there is therefore no other purpose in all of creation other than God’s purpose. Sin in its most specific description is anything opposed to God’s Will, which would therefore be evil. There is only one right way of doing anything, only one purpose in all of existence that is good, anything except for this perfect Will of God, is “missing the mark” and therefore is sin. Faith in God necessitates the belief that God’s purpose is good for His children. While notorious “faith heretics” attempt to define faith as confidence, and trust as commitment; the Greek New Testament has no such interpretation. The word trust is interchangeably used with the word faith, hope, persuasion, confidence, and assurance (Mainly as a verb, though also as a noun feminine, and pronoun). Others have attempted to state that faith is a religious trust, and a loyalty aspect as found within the meaning of the word (Wherein the etymology, as well as the usage prove this to be true), whereas trust is more (secular) specific to relationships, yet again the Greek New Testament which utilizes koine Greek finds no such distinction. 3. Holman Bible Dictionary, Holman Bible publishers, Nashville Tennessee, 1991, page 469 (Please, see for yourself).